Cal beach volleyball is going home for the start of spring break, but not in quite the same way as the rest of Cal’s students. The Bears took their longest trip of this season last weekend when they flew to Honolulu for the Heineken Hawaii Invitational, where they placed second after two excruciatingly close loses to No. 6 Hawaii. Despite maintaining a stellar record of 10-3 this season, that performance knocked the Bears down from 11th to 12th in the American Volleyball Coaches Association rankings. But this weekend could add to their wins and give them the potential to rise again in the future. On Saturday, Cal will host No. 18 Saint Mary’s for the first time this season and meet UC Davis once again at the Clark Kerr Sand Courts. Saint Mary’s currently mirrors Cal’s 10-3 record, with its only losses coming at the beginning of the season against No. 6 Hawaii, No. 1 UCLA and No. 5 Pepperdine. Saint Mary’s has had 10 straight wins since then, including two defeats of No. 14 Stanford, the first 5-0 and the second a more competitive 3-2. When the Bears earned their own 3-2 victory against the rival Cardinal two weeks ago, a celebration was in order. That success, however, won’t be enough to help them against a Saint Mary’s team that seems to be on even ground with the Bears. Cal and Saint Mary’s are similar in that they have both failed to beat any of the ranked teams on their schedules other than Stanford but have stayed consistent in their abilities to efficiently dispatch lower-caliber teams such as Utah and the University of San Francisco. Last year, the Bears opened their season with a 2-3 loss to the Gaels but went on to beat them in their next two meetings, 4-1 and 3-2. These teams have been evenly matched in the past, and their current situations suggest the same for this season. Cal should lean on their home advantage and recent experience against Hawaii to push Saint Mary’s over the edge. Cal has a more familiar enemy in UC Davis — the two teams already met once this season two weeks ago when the Bears handily defeated the Aggies 5-0 right before their match against Stanford. UC Davis hasn’t played a single match since then and maintains a 2-2 record. Considering that this is the brand-new program’s first season ever, the Bears were the clear favorites to win that first matchup. Since the Aggies haven’t gained any more tournament experience since then, their chances at an upset are looking even lower than before. Two players who will be crucial to the Bears’ success this weekend are the No. 1 pair of freshman Jordan Polo and sophomore Mima Mirkovic. The duo went 5-0 at the Heineken Hawaii Invitational, and Mirkovic stood out enough to earn the award for the best attacker in the tournament. The Bears’ consistency in addition to that of the No. 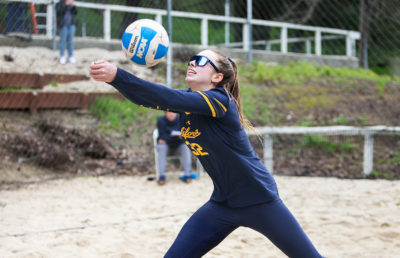 5 pair — senior Mia Merino and junior Abby Waldburger — has been crucial in keeping Cal competitive against ranked opponents, and the four should only be getting more effective as they find success against some of the top teams in the country. But as the Bears enter a long streak of competition against ranked opponents, consistency won’t be enough. All five pairs will have to work hard to improve their play if they hope to threaten teams such as No. 1 UCLA and No. 2 USC in the coming weeks. It all starts with Saint Mary’s this weekend and will just get harder from there. Alison White covers beach volleyball. Contact her at [email protected].